Shirley Louise Sanders, 83, a long-time resident of Truth or Consequences, passed away peacefully at her home on Thursday, October 18, 2018. Shirley was born in Vinita, Oklahoma to Harry and Dove Elizabeth (Petty) Mayberry. Throughout life, Shirley enjoyed writing and calligraphy, bird watching, nature and flowers, especially roses. She was retired from the Bank of the Southwest. 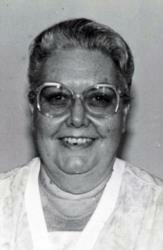 Shirley was met in heaven by her husband, Thomas Lucian Sanders, and her parents. She is survived by her son, Dale Leon Sanders; grandson, Clint Cody Garza; 6 great grandchildren: Miguel Miyamoto, Joshua Garza, Dylan Garza, Alyssa Garza, Clint Garza, Jr. and Leila Garza. Cremation has taken place, and no services will be held at this time. I had the pleasure of working with Shirley about 25 years ago at the bank. She was a very kind woman who was so excited for me when I had my son. She was a kind, gentle woman who I was glad to have known. My condolences to you and your family.